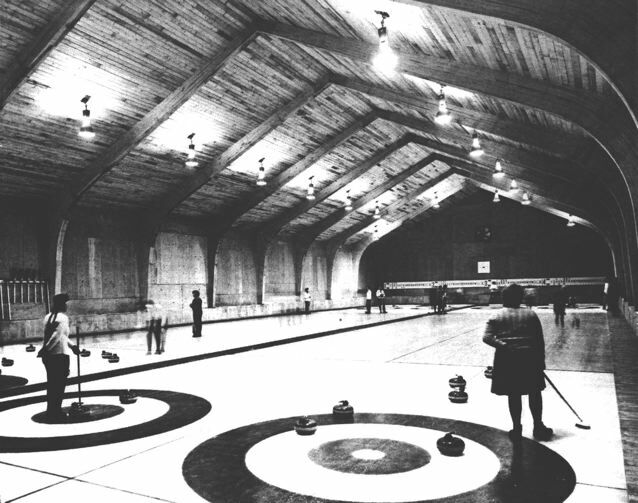 My curling story has lots of twists and turns and begins in the early 1990’s after my dear Mom passed away. As my two sisters and I were cleaning out her apartment, I noticed her golf equipment and asked my sisters if they wanted it. They said no, so I packed it up and brought it home with me to Sudbury, Ma. Immediately, I enrolled in a golf clinic through our local Park and Recreation Center. I was feeling good about playing golf, and then a few weeks later I accidentally re-established a friendship at the local gas station. The friend was a scratch golfer and was coming back from a medical leave to play. She heard my story about starting to play golf and invited me once a week in the summer to play golf with her. And I have been doing it ever since…almost 20 years. I’ll tell you how the sport is played in a minute. But first I want to tell you what it is that attracts me to curling? It helps me concentrate on strategy, efficiency on being on the “Broom,” and keeping my balance. There is a feeling of “well-being” working with the team, having the same goal. And I love the sociability involved. I have made a great many friendships over the years. I curl primarily in the a.m. with women, but occasionally will join the pick-up game Saturday mornings with both men and women playing. I have enjoyed many games at our home club or played away during each year at other clubs in competitions known as Bonspiels (competitive playing for points and/or pins or trophies). I have traveled to: Nashua, NH; and Brookline, Winchester, and Cape Cod in MA. Right now I am at the end of our season and curling once a week. But from November through January, I curled competitively with the women in what is known as Wintershield. That is when I would travel to other curling clubs for the day. 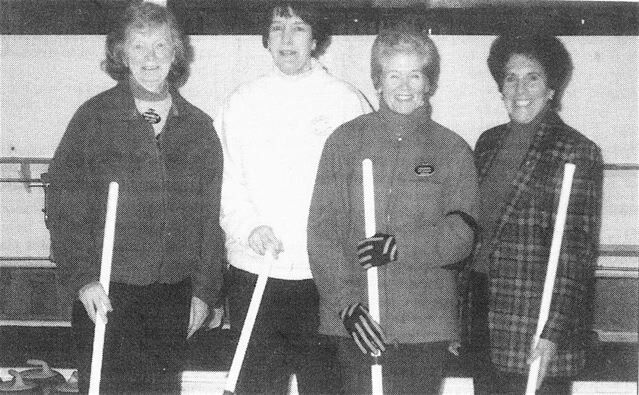 You can learn more about the Broomstones Curling Club at our website. The Club has 200 regular adult members, including 87 women, and another 168 college, junior and other kinds of members. Curling is done inside a building that is part “ski lodge” and part “hockey rink.” The ice is “pebbled” by an iceman or woman. What they do after each game is come on the ice and spray it with water as they walk down the lanes. Thus, the iceman recreates the small bumpy effect, as opposed to making smooth ice for ice and hockey skating. You do not need skates or special shoes to play. A clean pair of sneakers will do. The club will supply the broom for you. All you need to borrow or buy is a “slider” to put on the sole of the sneaker shoe that you will push away and glide while delivering a Stone. A Stone is a round-shaped granite rock that weighs 42 pounds and has a handle on top to grip onto. Some people struggle with the delivery. You will feel more comfortable after you practice. You do have the broom pole to hold onto with the other hand for support. The two teams are each made up of four players, so you need eight players to start each game. The Captain (known as the SKIP) is the director of the game. Each team’s SKIP is situated at the far end of the lane (which is called a SHEET). The VICE SKIP is the assistant, and the 2ND person will start off escorting the stone that (the LEAD player has “pushed” or “thrown” and) is then gliding down the ice in the lane. The two people escorting the stone have ordinary-type brooms and will judge the force of the throw. The SKIP will judge the line the stone is traveling to its ultimate destination. That is when the SKIP will yell SWEEP-SWEEP and HURRY-HURRY as the stone is arriving at the other end of the ice towards the bulls eye area, called the HOUSE. The escorts (the 2ND’s) will sweep the ice, clearing it of any loose ice bits to make it smoother if they want the stone to travel farther. Sweeping causes the ice to melt and generally causes the stone to move faster and straighter; less sweeping means that a stone will slow down more and CURL (turn) more. Usually, the LEAD will set up some blockage with the two stones she has thrown (they are called GUARDS). The team-mates turns are rotated by the other team (opposition team) taking turns. Each person throws two granite stones. One does not pick up the stone like a bowling ball, but gently swings it from back to forward and, depending on what the SKIP directs you to do, either an inside (clockwise) or outside (counter-clockwise) turn. This rotation determines how the stone will travel to its final destination—whether it will be a “DRAW” into the HOUSE, in front or behind a stone or be a “TAKE OUT” of an opponent’s stone. Between the length of the lanes there are two HOG lines. The closest one to the team delivering the stone signifies that the player throwing the stone must release their hand from the handle of the stone before it reaches the nearest HOG line. The farthest HOG line signifies that the stone must travel over it in order to keep it in play. If the stone does not reach the second HOG line, then it is taken out of play. Wall Street trading is often described as a blood sport. But inside the great investment houses, the sport of the moment is, of all things, curling — that oddball of the Olympics that is sort of like shuffleboard on ice.